Sunroom additions from SRA Home Products are a perfect way for homeowners in the Warminster and Willow Grove, Pennsylvania areas to enjoy the views around their homes while remaining protected from the elements. They are sure to enjoy watching a magnificent lightning storm or a colorful sunset from the comfort and protection of their new sunroom, where they’ll never have to worry about insects, windblown debris, or harmful UV rays. Extreme durability – Our sunroom additions feature TEMO’s exclusive TEMKOR surfacing, which is fade-, dent-, and scratch-resistant to help them withstand the elements without becoming damaged. Architectural beauty – We offer several different kinds of sunroom additions, so you can choose the one that best fits your home’s individual style. Year-round comfort – You can choose to have an HVAC system installed in your sunroom, which, paired with our energy efficient windows and doors, can help your new space maintain a comfortable inside temperature all year long. 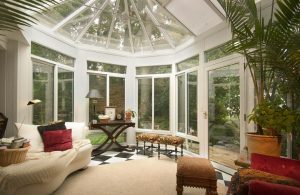 Additionally, there are several benefits of choosing SRA Home Products to provide you with your new sunroom. For example, we offer a convenient installation process carried out by our factory-trained and -certified technicians – not subcontractors – to ensure we provide only the highest level of craftsmanship. Once our knowledgeable and respectful employees arrive at your home, it will be clear to see how we have earned an A+ rating from the Better Business Bureau. What’s more, the sunroom additions we install are covered by a limited lifetime transferrable warranty, allowing you to rest easy knowing that your investment is protected. To learn more about the TEMO sunroom additions we install around the Warminster and Willow Grove, PA area, contact SRA Home Products today. We can easily schedule you for a free at-home consultation.